Josh Groban, John Mayer, Clay Aiken differences, Josh Groban, John Mayer, Clay Aiken quizz. Consider yourself a fan of Josh Groban. See how well you can differentiate between this Christian crooner and fellow songsters Clay Aiken and John Mayer. Get at least two right, and maybe, just maybe, you can call yourself a true fan. Josh Groban is known for his hit single, "You Raise Me Up," Groban is touring on his latest release, Closer. John Mayer may have won a Grammy for "Daughters," but he lost big time on this year's fashion red carpet. Clay Aiken: Sure, he lost to Ruben Studdard on American Idol, but he sold more records with his debut release, "Measure of a Man." 1. Who said, "I knew what I wanted to do when I was 13 and I had to go through four years of high school to get out. That's a blessing, because I never had to lay on my bed staring up at the ceiling going, 'What am I going to do with my life?'" 2. Whose last name is actually Grissom? 3. Who played a teen named Malcolm who sues his prom date on Ally McBeal? 4. Who is originally from Los Angeles? 5. Who dated Jennifer Love Hewitt? 6. Who demonstrated his ability to turn both his feet backwards on the Ellen DeGeneres show? 7. Whose song plays during the ending credits of Troy, a movie starring that other sensitive hunk, Brad Pitt? 8. Who sang a duet on his debut album with Charlotte Church? 9. Who sang "Proud of Your Boy" for the special edition Aladdin DVD? 10. Who dropped out of the Berkeley School of Music in Boston? Answers are: Josh Groban, A, is the answer to 3, 4, 7 and 8. John Mayer, B, is the answer to 1, 5 and 10. Clay Aiken, C is the answer to 2, 6 and 9. 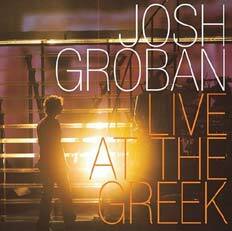 Josh Groban "Live at the Greek" DVD (includes CD): ORDER IT NOW.